"Dear Tim: I have always had a fascination with the Max Lange Attack ever since IM George Koltanowski gave a simultaneous exhibition in San Antonio about 57 years ago. He graciously stayed and talked with 3 of us 16 yr. old kids for 2 1/2 hours about all aspects of chess. I asked him why he played the Max Lange Attack so frequently in simuls. His response was that the many traps and tactics allowed him to defeat many of his opponents quickly so he could concentrate on the remaining players. I have mostly had to play the Max Lange from the Black side as few of my opponents enter it when they have Black." "Here is an ICC game where I have White against a solid opponent who has beaten me a bit more often than I've beaten him. 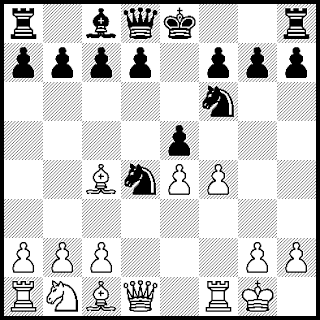 My opponent played the correct move on 4...Bxd4, which leads to the Koltanowski Variation, but makes a mistake at 7...Nxe4? and remains on the defensive. I like taking the e-pawn with my f-pawn as it gives White an open f-file as in the Blackmar-Diemer Gambit. 9.Qf3! would have kept him on the defensive, but I played 9.Qg4? instead. [It seemed like a good idea at the time.] I was able to regain the offensive with his King in the center and got all my pieces developed to finish the game."